For today's card I used the "Great Things" stamp set from Simon Says Stamp. This stamp set was designed by Cathy Zielske. Gotta love a CZ set! I started out with a piece of Canson watercolor paper taper down to a board. I added a bunch of Distress Oxide ink randomly to the paper in the colors Candied Apple, Spiced Marmalade, Fossilized Amber, Twisted Citron, Salty Ocean, and Wilted Violet. I then filled in any left over space with Black Soot Distress Oxide ink. Once the blending was done I flicked some water onto the paper with my hand and then soaked it up with a paper towel. This soaks up the color a little bit in those areas. Next I took out my Gansai Tambi watercolors and used a small paintbrush to flick tiny splatters of paint onto the background. I used the colors white, and white gold. I also used my Reeves white watercolor to add some more splatters. I find the Reeves to be a little bit more opaque. I stamped three of the sentiments from the "Great Things" stamp set onto a piece of black cardstock with Versmark ink. I heat embossed these in a white embossing powder. All together these three sentiments will read "Don't stop believin' hold on to that feel-ay-e-eh-en." Which is of course awesome. Who doesn't love Journey?? I cut the smaller two sentiments into strips and fussy cut the larger one. I took the larger sentiment and glued it to some vellum using my Gina K Connect glue and then fussy cut the vellum to give it a border. I popped up my background panel onto a card base using foam tape. I then popped up the three sentiments on the background. I added some clear sequins and some tiny silver star sequins using my Gina K Connect glue. I arranged the sequins to flow across the background from the upper left corner to the bottom left corner. Next I used a T-square ruller and a white gel pen to add a border around the edge of the background panel. Finally I used my Wink of Stella glitter brush to add some sparkle to the two sentiment strips as well as the border of the background panel. For today's card I used Distress Ink and my Gansai Tambi watercolors to create a galaxy card. I started with a piece of Canson watercolor paper taped to a board. I blended Distress ink all over the panel in the colors Mustard Seed, Peacock Feathers, Seedless Preserves, and Dusty Concord. I added splatters of a shimmery white (color #906) paint from the Gansai Tambi watercolors. Then I used a paintbrush and clean water to blend out all of the Distress Ink. I added a few colors of Gansai Tambi paint (#43, #57, #37) to brighten up some of the color. I kept adding splatters inbetween everthing else that I did to the piece. I used the black (#20) Gansai Tambi paint randomly across the panel. Once that was dry I added some more Distress Ink to really deepen up the color. Finally I added some more splatters and then the galaxy was finished. 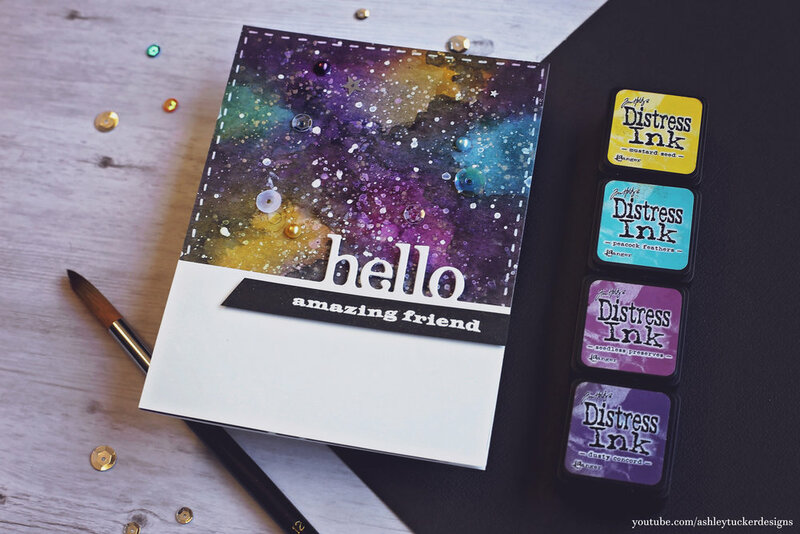 I used a Spellbinders die for my hello sentiment and the Hero Art's Friends stamp set for the other sentiment. For the finishing touches on this card I added dashed lines around the galaxy border. I also added half pearls and sequins to the galaxy. Finally I added Wink of Stella glitter to the sentiment strip. For today's card I used the Mama Elephant stamp set "Me and My Dragon." I decided to use the little wolf in the stamp set to create this watercolor scene. I used my Reeves watercolors to pain the sky and the grass. I used my Arteza Real Brush Pens to color the little wolf. As I was painting the sky I wasn't liking it too much, but I knew that with this kind of technique it is going to look kind of funky until the very end so you have to stick with it. In the end I do really like it. I think when you splatter the stars on with the paintbrush something magical kind of happens. To finish the card up I used these tiny sequins that are star shaped and glued them all over on the sky. They are a little detail but I think they really add a lot to it!